Comcast is one of the largest cable TV and Internet service providers in the United States, and the company on Thursday released the Comcast Mobile App for iPhone (iTunes Store link), which allows you to access some of Comcast’s services from your iPhone or iPod touch over Wi-Fi. In this first look, I’ll take a sneak peek at some of the Comcast Mobile App features. If you use Comcast services on a regular basis, this app may be one to add to your iPhone or iPod touch. The Comcast Mobile App lets you access your Comcast e-mail, manage your Digital Voice account, peruse Comcast’s TV listings, and watch trailers for movies on Comcast On-Demand. The opening interface can be viewed as a list, a grid, or in a CoverFlow-like icon rotation. Shaking the iPhone switches between these three views. Tap on the Inbox (also called SmartZone Inbox) in the opening interface and you’ll find an inbox for both your e-mail and voicemail. The inbox has a tabbed interface, so you can see only e-mails, voicemails, or both. The combined inbox is a convenient way to see your messages, but it’s also separate from the mailbox that’s already on the iPhone. You can’t see other e-mail accounts (like, say, a Yahoo account) through the Comcast Mobile App. You can still use the iPhone Mail app to access your Comcast e-mail. 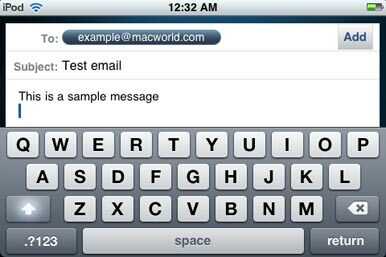 The Comcast Mobile App lets you write e-mails in landscape mode, just as the built-in Mail app does. But the Comcast landscape mode is actually missing the Cancel and Send buttons, and you’ll need to rotate the iPhone to portrait mode to send the e-mail. It's a relatively a minor detail, but it can be annoying if you frequently send e-mails and use the landscape mode. 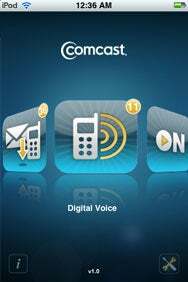 If you have Comcast’s Digital Voice service, you can manage your voicemail account through the Comcast Mobile App. You can see new voicemail messages in the SmartZone Inbox, but if you tap on the Digital Voice selection in the opening interface, you have more voicemail management options. In the Digital Voice section, you can see voicemail messages, as well as a list of outgoing calls and missed calls on your Digital Voice phone (not the iPhone). You can also set your Digital Voice account to forward calls to a phone number, such as your iPhone’s number. To listen to a voicemail, just tap it. If the person who called you is in your address book with a picture, the picture will appear on screen; if not, then a default icon appears. A slider bar lets you rewind or fast-forward through a message. 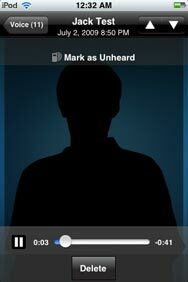 You can also delete messages or mark them as unheard. The Address Book in the Comcast Mobile App plugs into the iPhone's Address Book. If you add, modify, or delete a contact in the Comcast Address Book or the iPhone Address Book, the changes are made to the other address book. If you use a Comcast.net address book online, the contacts in your Comcast Mobile App sync with the online address book. 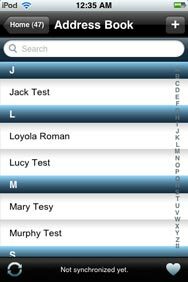 Tapping on an e-mail address in the Comcast Address Book starts a new e-mail within the Comcast Mobile App. Tapping on a phone number in the Comcast Address Book calls that number through your iPhone. You can use Plaxo to sync your contact databases between your Mac's Address Book and your Comcast.net account. Comcast provides access to TV listings through The Guide. You can mark shows as a Favorite, Share a program description with someone over e-mail, or set a reminder, which will activate an alert on your iPhone when the show is about to start. When you tap on a show, you get a description of the episode to be aired. Tap on Other Showtimes, and you get a list of future airings. All of these functions are isolated on the iPhone, however. There's no interoperability with Comcast digital video recorders, so you can't, for example, set your DVR at home to record a show remotely or over your local area network. A Comcast representative told me that DVR interoperability is a feature that they’re working on for future versions of the app. To make sure you’re seeing the correct guide for your area, you have to enter your zip code. If you’re in out of town (for example, on vacation across the country) and you want a guide for the Comcast cable TV in your location, you can simply enter the proper area code and the app updates The Guide. When I think of "On Demand" I think of being able to order movies or TV shows when I want. Sort of like the way On Demand works on my cable TV at home. There are issues of digital rights management that needs to be worked out in order to allow you to download to stream movies or TV shows to your iPhone. If the DRM issues are ever worked out (and the bandwidth issues are also addressed), we could see a change in what’s offered in the On Demand feature for the Comcast Mobile App. 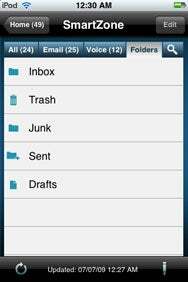 For anyone who relies on Comcast e-mail and voicemail on a regular basis, the Comcast Mobile App could prove to be a useful addition on your iPhone. I’ll be working on the review and mouse rating for the Comcast Mobile App in the next few days.